Sky-high architectural heels are all well and good, but sometimes your feet deserve a break at summer events or on off-duty days. Here, our John Lewis style spotter offers advice on how to incorporate fabulous flats into five of this season’s top trends, while I pick out a few of my favourite pairs. Strappy sandals and boyish brogues epitomise 1920s footwear fashions and are worn this season with drop-waist dresses, wide palazzo pants and cropped trousers. Of course you could go for mid-heel round-toes for dance-floor glamour, but woven leather and lace details make these flats a worthy partner for any flapper dress or silk pyjama suit. Animal print, beaded detailing and safari style are always big in the summer months, but even more so this year with Burberry Prorsum, Donna Karan and Michael Kors leading the way into the fashion jungle. There’s only one type of footwear for this look – desert sandals, and we’ve hunted down these Carvela leather gladiators and L.K. Bennett cheetah strap sandals. The sports luxe trend has seen even the least athletic of fashion fans don jogging bottoms and streamlined shapes in time to cheer on Britain’s Olympic hopefuls this summer. With sports style now acceptable city wear, you can invest in a pair of pretty trainers with no practical justification needed. 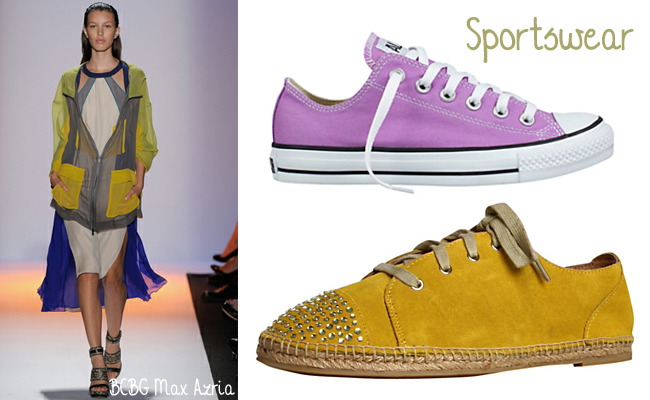 Hit the sports-lux and pastels trends in one purchase with these lilac Converse, or take inspiration from Roman Olympians with updated espadrilles. Ice cream-inspired colour palettes sweetened up spring/summer ’12 runways, with the likes of Mulberry, Prada and Phillip Lim creating fresh fashion sundaes with powder pinks, baby blues and luscious lilacs. Footwear is an easy way to buy into this trend, particularly if you don’t want to go for all-out sweet-shop style. Toughen up the look with studs and trainers, or get girly with pretty bow-front pumps. Whether it’s through space-age style influences or fashion’s underwater love, high-shine means high-impact this season. Update classic black ensembles or on-trend nudes and neutrals with a flash of silver. 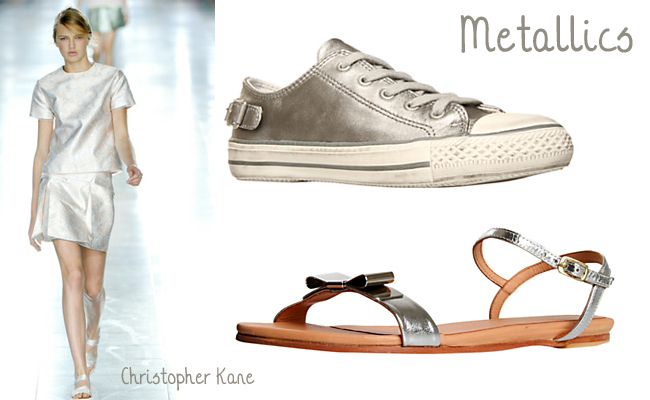 These Kurt Geiger trainers are perfect for daytime looks, and the brand’s metallic bow sandals could even make for cute low-key wedding shoes.